Installing a new ceiling fan is a thrifty way to reduce your energy bills without sacrificing comfort. A fan installation is a perfect weekend project for any avid do-it-yourselfer because it only requires a few hours to complete, and the payoff is immediate. You don't have to be a home improvement expert to install a ceiling fan, Del Mar Fans & Lighting's videos and instructions below can help you get started. Hi. I'm Colby with Del Mar Fans & Lighting and I'm here to show you how to install a ceiling fan. We've got this light fixture in a popular area in the home and in the summer it just gets a little warm and in the winter it gets a little too cool. So we want to install a ceiling fan with a light kit, so that we can recirculate the cool air in the summer and recirculate the warm air in the winter and also have proficient light for all the tasks we need to do in the area. Come join me, I'm going to uninstall this light fixture and then install the ceiling fan and of course remember before you uninstall any or install any electrical products in your home to turn the power off at the circuit breaker box. Next you want to be sure that your junction box is rated for ceiling fans. This particular one is not so we're going to replace it with one that is and this junction box is rated for ceiling fans because it has a T-Brace that supports the box within the joist in the ceiling. There are also junction boxes that mount directly to the joist in the ceilings that are also rated for ceiling fans. So come join me as I uninstall this one and install this one. Now that we've installed our ceiling fan junction box, we're going to start to install our ceiling fan. We'll begin with the ceiling fan mounting bracket. We're going to mount that directly to our ceiling fan junction box. Now we're going to head to the table and assemble the motor with the downrod assembly and then also put together the blades with the blade arms. Now we're going to hang the motor assembly onto the mounting bracket. Fits in like that and locks right in. Since we're replacing a light fixture, typically that's going to come with one switch allowing you to control the light only. Since we're installing a ceiling fan with a light combination, we're going to want to use a remote controlled or two wire wall control so that we can control this ceiling fan separate from the light. So what we've done is we've selected a ceiling fan with a two wire wall control and we're going to go ahead and install the receiver module in the canopy assembly first. Ceiling fan would most likely come with a hardware pack that would include all the wire nuts you need as well to secure all of your wire connections. Now that we got through the hard part, we're going to go ahead and install the ceiling fan blades to the motor housing. After the final blade is installed, I go around and tighten each one just one more turn. Now that we have these cool blades installed, we're going to install the light kit. Well, this completes the ceiling fan installation. Now we can stay warm in the winter, cool in the summer and we have plenty of light to complete our tasks. Take care and thanks for joining me here at Del Mar Fans & Lighting. For this ceiling fan installation video, we used Casablanca fans. Click here to view more installation videos. Choose a UL-Listed outlet box marked "Acceptable for Fan Support". Read the manufacturer's instructions for additional caution, safety, and warning information. You have purchased the perfect ceiling fan – the right size, style, and finish, and are looking forward to basking under the gentle breeze. As you prepare to install the new ceiling fan, here are 10 basic tools to keep handy in your toolbox for any application. Having the right set of tools to install a ceiling fan guarantees a safe project and timely finish. Crescent Wrench – Also known as an adjustable wrench, a crescent wrench has a set screw that adjusts the width of the wrench by moving one of the two jaws to the right or left. Use a crescent wrench to tighten a support brace or any bolts. Cordless Drill with Long Bit – Drills holes in various materials. Use a cordless drill to install the junction box or utility box to the ceiling joists. Voltage Tester – Also known as a test light, the tester consists of two leads that detect the presence of electricity in a fixture. Use a voltage tester when wiring a ceiling fan by placing one of the leads on the ground wire and the other lead on the hot wire to ensure there is no electricity running through these wires. Wire Cutters/Strippers – Also known as diagonal pliers, wire cutters as their name implies cut wire by indenting and wedging the wire apart. Wire strippers strip the electrical insulation from the end of electrical wires. Many hand tool manufacturers offer wire cutters and strippers as a combo. Use these tools to install a ceiling fan by cutting and stripping the ceiling fan wires during the downrod assembly. Pliers – Holds an object firmly in place. Use pliers to tighten set screws and lock nuts during the downrod assembly. Screwdrivers – Used to turn or drive screws. The most common screwdriver types are flat-head screwdrivers and Philips screwdrivers. Use a screwdriver to tighten and secure the screws on the motor housing and blades to prevent any wobbling or shaking. Some brands may include a screwdriver in the packaging. Electrician’s Tape – Also known as insulating tape, secure electrical wires and other materials that conduct electricity. Electrical tape is pressure-sensitive and flexible while providing long-lasting insulation. Use electrical tape to insulate all wire connections. Ladder – Use a ladder to reach the mounting bracket and hang the motor assembly as well as wire the ceiling fan. If your ceiling is 9 feet or higher, choose a 5-foot stepladder. If your ceiling is 12 feet or higher, choose an 8-foot stepladder. If your ceiling is 15 feet or higher, choose an 11-foot stepladder. Dusk Mask – Protects you against inhaling dust and other debris while assembling, installing, or cleaning a ceiling fan. Safety Glasses – Shields your eyes from hazardous materials and flying debris during the installation process. 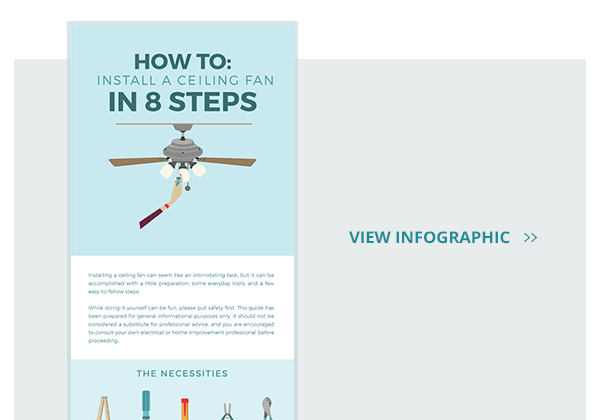 Use these tools to install a ceiling fan or to troubleshoot your existing ceiling fan, and be sure to view our selection of brand-name ceiling fans. If you need more information, be sure to read Del Mar Fans & Lighting's guide on ceiling fan troubleshooting. Where To Hang A Ceiling Fan? Turn the power off at the circuit breaker and the wall switch. If removing a light fixture, uninstall the fixture in following order: glass fitters, light bulbs, canopy, and mounting bracket. If removing a ceiling fan, uninstall the fan in the following order: light kit, fan blades, canopy, motor assembly, and mounting bracket. Once you have identified the ideal location for your new ceiling fan, you will need to gather the following tools and materials to replace the existing electrical box with a UL-listed outlet box marked "Acceptable for Fan Support". The outlet box generally supports up to 50 pounds. If your fan weighs more than 50 pounds when in motion, you will need a heavy duty brace for additional support. See Del Mar Fans & Lighting’s selection of ceiling fan mounting systems. Remove any screws and washers with a screwdriver. Pull the electrical box through the opening in the ceiling. Be careful not to damage or crack the ceiling. If the box is stuck, place a scrap of wood in the electrical box and tap the wood with a hammer to loosen the box. Remove any ceiling debris and/or dirt. Insert the support brace into the opening in the ceiling and position the brace between the nearest two joists. Turn the support brace with your hands until it lock into the joists. The teeth at the end of the brace will grip the joists and hold the brace in place. If needed, use a crescent wrench to finish tightening the brace. Place the u-bolt over the safety brace with screws provided. Remove a knockout on the outlet box and attach a cable clamp. Feed the supply line through the clamp so the line extends 6 inches from the box. Guide the outlet box through the opening in the ceiling and align the box with the u-bolt brace. If the hole in the ceiling is too small, use a keyhole saw to enlarge it. Attach the outlet box directly to the brace with the washers and nuts provided. Please note that the bottom of the box must be recessed a minimum of 1/16 inch into the ceiling. Installing a ceiling fan is not difficult, but it may take a few hours to complete based on the fan type and your home improvement experience. Once you are ready to start, you will need the following materials and tools. See Del Mar Fans & Lighting’s recommended list of ceiling fan installation tools. Secure the mounting bracket to the outlet box with the screws and washers provided. Feed the electrical wires through the opening on the mounting bracket. Remove the shipping blocks from the motor. Discard the blocks, but save the screws for the blade iron installation. Loosen and trim the ceiling fan wires 6 inches longer than the downrod you're using. Strip ½ inch of insulation from the end of all the wires. Remove the setscrew on the motor coupling. Thread wires through pre-assembled downrod and hand tighten downrod onto the motor coupling (about 4-5 full turns). Fasten the setscrew on the motor coupling and tighten with pliers. Pull the wires and downrod through the canopy. Allow the canopy to sit loosely on top of the motor housing. Lift the motor assembly and place the downrod ball into the slot in the ceiling bracket. Rotate until the fan locks into place. Place wall control receiver into the mounting bracket. To connect the wires, hold the bare metal leads together and place a plastic wire connector over them, then twist clockwise until the connection is secure. Connect the grounding wires from the ceiling, downrod, and hanging bracket with a wire nut. Connect the white wire from the fan and white wire from the receiver marked "To Motor" with a wire nut. Connect the black wire from the fan and black wire from the receiver marked "To Motor" with a wire nut. Connect the blue wire from the fan and blue wire from the receiver marked "To Motor" with a wire nut. Connect black wire from the ceiling to black wire from the receiver marked "AC In" with a wire nut. Connect white wire from the ceiling to white wire from the receiver marked "AC In" with a wire nut. Turn the connections up and push them through the hanger bracket into the outlet box. Separate the wire connections, with the grounded wires on one side of the outlet box and the ungrounded wires on the other side of the box. Be careful not to pinch any wire connections. Remove the switch plate cover and remove all the wiring from the switch. Connect the black wires in the outlet box. Connect the two green wires from the outlet box to the grounding wires from the wall control. Push all the wire connections into the outlet box. Spread wire connections apart, with the grounded wires on one side of the box and black wires on the other side of the box. Insert the wall control into the outlet box and secure with the two screws provided. Install the switch plate cover with the two screws provided. Slide the canopy up to the mounting bracket and align the holes in the canopy with the screw holes on the bracket. Insert the canopy screws provided into the holes and secure tightly. Insert the grommets into the holes in the fan blades. Secure each blade to the blade iron with the screws provided. Lightly attach the blade irons to the motor housing with the screws provided. Tighten all the screws once all the blades are attached. Screw two housing assembly screws into the motor housing (it does not matter which screw holes you choose). Feed the wire supply through the center hole of upper switch housing, then wrap the keyhole slots around the screws and twist counterclockwise to lock into place. Insert the third screw and tighten all three screws. Connect the plugs from the upper and lower switch housings (make sure the colors line up). Lift the lower switch housing up and line up with the screw holes in the upper switch housing. Insert three switch housing screws and tighten all screws. Loosen the thumbscrews on light kit and thread glass shade, then tighten the thumbscrew. Install a bulb in each of the light sockets. Please note that installing the light kit may vary depending on your ceiling fan with lights. Connect the pull chain or fandangle to the short chain coming from the switch housing. Turn the power on at the circuit breaker and wall switch. Sync the ceiling fan and wall switch (directions may vary with fan model). Verify the ceiling fan turns on and off, and operates on all speed settings. Verify the lights turn on and off, and operate independently from the ceiling fan. If your fan includes a reverse function, confirm the fan blades spin in the opposite direction by reversing the airflow. See Del Mar Fans & Lighting's guide on how to reverse a ceiling fan. Using a ceiling fan with your air conditioning and heating system reduces energy consumption and increases utility bill savings. Some homeowners have reported an annual savings of $500. Remember, you may sacrifice a few hours to install a ceiling fan, but the comfort and savings is worth the time. When it comes to installing a ceiling fan, there is little difference between the various ceiling fan brands. However, certain brands and models have specifics that are worth explaining. Del Mar Fans invites you to read our brand-specific fan installation guides for our most popular brands, like Casablanca, Fanimation, and Hunter. Wiring and installing a Hunter ceiling fan is easier than most brands. Their “5-Minute Fan” comes 90% pre-assembled, making installation a breeze. All you need is a screwdriver, wrench, pliers, and a ladder. Casablanca ceiling fans are easy to install and highly fashionable. We offer custom guides for three of their most popular fans the Panama, the Stealth, and the Wailea. Read on to learn more about how to install Casablanca ceiling fans. Installing a Casablanca Panama fan is simple and straightforward, but because these fans have five blades instead of four, they can take a little longer to install. In addition, an optional lighting kit will add to the installation time, but will help provide a versatile lighting solution for your home. Don’t forget that you’ll need a cordless drill and wire cutters to install a Casablanca Panama fan, so be sure these are available to you. Installing a Casablanca Stealth fan is simpler than most Casablanca fans. All you will need are wire cutters, an Allen Wrench set, a screwdriver, and a ladder. Stealth fans are smaller and sleek, which makes them perfect for bedrooms, offices, and any space up to 300 square feet. The Casablanca Wailea fan is designed for small spaces that can attract moisture, like a laundry room or walk-in closet. This presents unique installation challenges, but installing a Wailea fan by Casablanca is still simple. All you will need are wire cutters, the included Allen Key, and a Phillips-head screwdriver. Installing the Zonix by Fanimation , a sleek, modern-looking fan, may seem like a daunting task, but it is quite simple. The places attach directly to the mounting without using blade irons, which helps to reduce the amount of work required to install the fan. All you will need is a Phillips-head screwdriver, wire strippers, and a ladder! Del Mar Fans hopes that you’ve found our ceiling fan installation video and written guide to be helpful and informative. Be sure to read other articles in the Del Mar Fans Blog to learn more about maintaining fans, installing lighting fixtures, and improving your home’s energy efficiency!